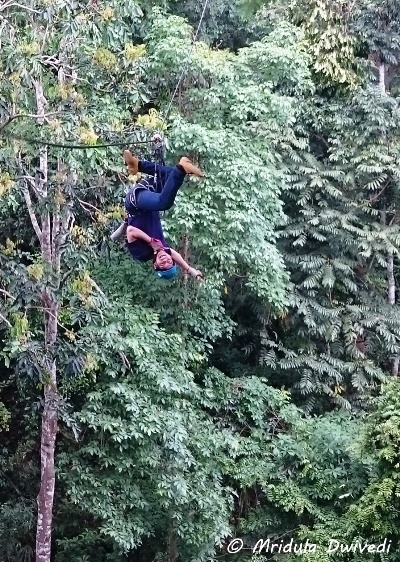 When I heard that we were taking a 45 minute drive out of Chiang Mai (Thailand) to experience a zipline, I was not too sure what we were up to. I have done ziplines before. I agree they are a lot of fun while they last, which is often less than a minute. I was not sure I wanted to travel for 45 minutes to do it. But then it was before I encountered Flying Squirrels beyond Chiang Mai. 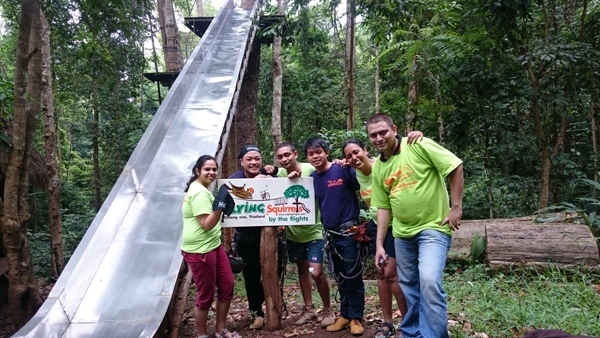 Flying Squirrels is a two and a half hours adventurous course made of 32 stations. It has 17 ziplines, 1 abseil, 6 walking steps, 2 climbing nets, 2 sky bridges, 1 Tarzan Jump, 1 skateboard, 1 bicycle zipline and 1 slider. Their website gives a very good map of the various activities on offer. 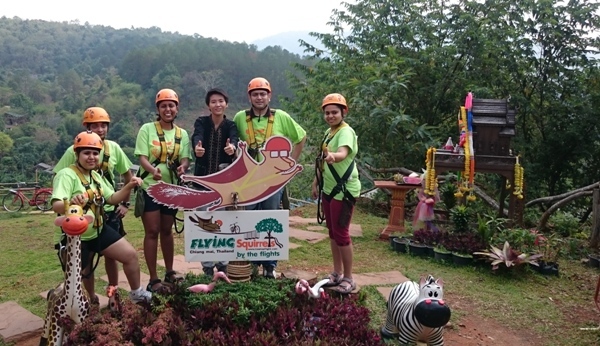 June was the manager for Flying Squirrels who joined us for the group photograph. 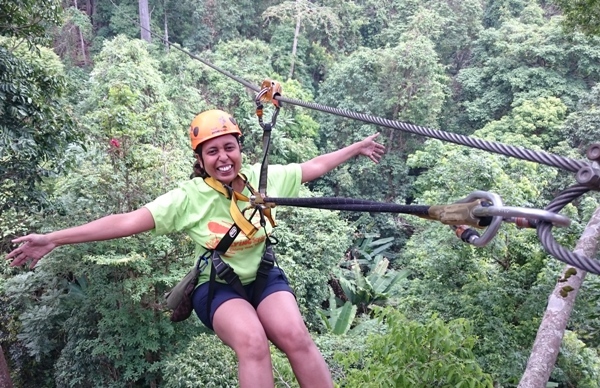 It was quite an experience to zip through 17 times over a canopy of green. It was fun to glide over the giant tree tops. The rest of 15 courses kept me completely engrossed as well. In fact I was so into doing the activity that I hardly noticed the lush green surroundings. I have enjoyed them more through the pictures I clicked. That is How a Pro Comes on a Zipline! If you wish to carry a cell phone or a camera on the lines, you need a way to secure them. The camera can’t be held in hand because one is bound to drop it while zipping through. The folks at the Flying Squirrels gave me a pouch to carry my cell phone. I am really thankful for their suggestion or else I would have missed out on so many fun pictures! 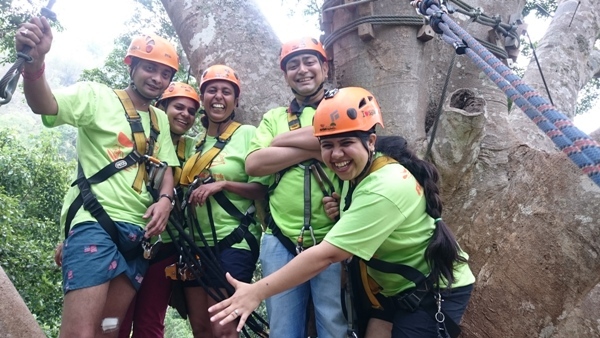 The longest zipline is 600 meters. It is so long that if you are light weight you might not reach the end of the line! It happened to our lightest colleague. One of the flight instructors had to go and fetch him from the line where he had stopped on his own! Every group has two instructors; the first one would send you on the line securely. The other instructor would receive us at the end of the line and help us in landing. At the landing they often asked us to raise our legs. The help was needed also to avoid collision with the trees that stand firm at the landing stations. 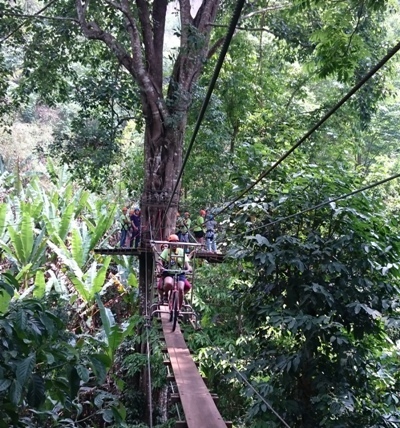 The platforms for the ziplines are quite high and sometimes narrow. As soon as I would land on such platforms the instructor would secure me to a line firmly. It is imperative that we do not unfasten from the line while waiting for others to land. It was drilled into us to leave the lines well alone, only instructors would touch them. As Thai names are quite difficult the nicknames of our instructors were Pong and Kishan. Actually Kishan was not the nick name but it was easy for me to remember. For the entire course we were in their good hands. We were a group of five people plus two instructors. One of us left the course after maybe 5 stations! Amongst the rest I was declared to be the most fearless. About half way through the course I started wondering why was I not scared when everyone else was. It was only later in the evening I realized that I too was quite scared till I was securely clipped to the line. Most of the platforms are high and I would not step up till Pong snapped all the three security lines in place. But once I was secure, letting go was easy and fun for me. At one platform Pong asked me if I would like to get my picture clicked hanging in the air. I was game for it. If you look at the picture closely, you can see that I am still clipped to the line. But there is another picture of mine, taken by their professional photographer where I actually left my hands while going on the zipline! They give that photograph to me as a souvenir. Our instructors were fun. For them it was not enough that we were doing the 32 courses. They would tug the line while we were hanging on it. They sometimes shook the walking steps too. For me that was good fun but I am not sure everyone would agree with it. The last obstacle is a steep slide where they put you inside a sack and let you zoom through. We were all smiles after doing the entire course successfully. I had gone in wondering why someone would drive for 45 minutes to do a zipline! After two and a half hours I knew exactly why. The day ends with lunch being served at the Flying Squirrels headquarters if you are doing the morning course. After experiencing the Flying Squirrels I would never think of a zipline as simply a zipline! 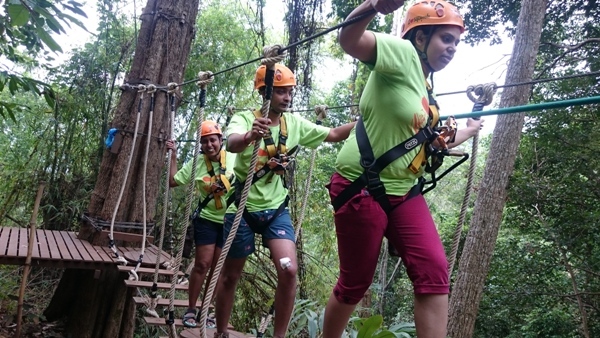 Who knew ziplines could be so much fun! PS. My trip to Thailand was sponsored by TAT New Delhi!